MANILA: Finally! A much-anticipated wait is over. The refreshed Mitsubishi Mirage is now in the country for which we all have been waiting with the bated breath since MIAS 2016. Yes, you read it right. A cash-cow of Mitsubishi has landed on the Philippine soil this morning making the TGIF (Thank God It's Friday) all the more special for every Filipino. 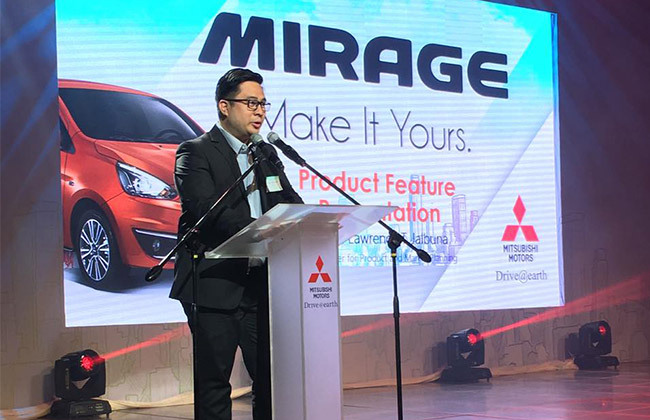 Ever since its launch in the country, Mirage has been a golden goose for the Mitsubishi Motors Philippines and in October 2012 alone, the company has made a record sales of 1,098 units. In order to continue attracting the hatchback fans, the Japanese brand has lifted the wraps off of the refreshed version of Mirage in front of its die-hard fans at the Solaire resort and Casino. The 2016 Mirage variants can't be considered as a total departure from its previous models when we look at the same powertrain, but it will surely build on the success of previous Mirage variants with an all-new front fascia and overall appearance. The new Mirage now proudly sports a new front grille with a hint of chrome and a refreshed bumper which conveniently encompasses bi-xenon HID projector headlamps with DRLs. The wheels had undergone a makeover too, as the GLS variants now sport 15-inch dual-tone alloys, while the GLX wears 14-inch ones. If these new features weren't enough, the company has upped the lighting game of the Mirage by incorporating welcome and coming-home lights. If not by much, the cabin has also been slightly upgraded with the use of premium materials. While the mechanics of the refreshed Mirage variants remain unchanged with 1.2-litre 3-cylinder engine, all CVT models do get an upgrade to their tuning to improve fuel efficiency and response. This Euro 4 compliant engine is capable of achieving a maximum output of 78 PS at 6,000 rpm and 100 N-m at 4,000 rpm of torque. Also, an improved NVH tuning and sound insulation have been integrated which were not present before. After this new launch, it would be interesting to see the battle between Honda Brio 2015 and Mirage 2016. Watch latest video reviews of Mitsubishi Mirage to know about its interiors, exteriors, performance, mileage and more.